the Wee People chant to Mother Earth and Nature. As the cold rains descend on the northern Florida lawns the Wee People ride in on black moles that are afterwards released to run wild like nomadic horses. In the dark of the night the Wee People plant their mushroom seeds. Suddenly a village of canopies shoot up, strong cones, some large, some small. 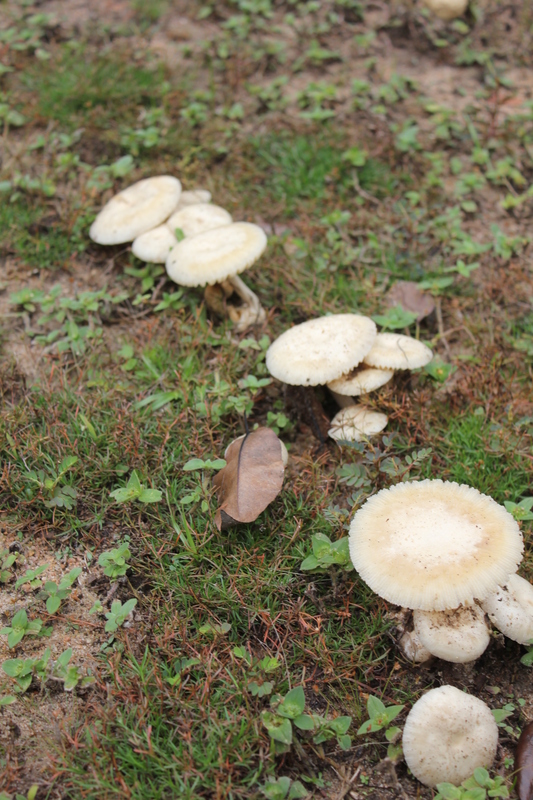 As more and more Wee People appear with the rain, they organize their mushroom canopies into circles and squares and rectangles. On the edge of the village are small outposts, watchers who alert the others of The Giants and their cruel cutting machines. The Wee People are invisible to The Giants. But at night, out of the corner of The Giant’s eye they might see a flicker of light, or hear a murmur as the Wee People chant to Mother Earth and Nature. Only the animals of the forest, like the fox or deer, can really see them as the animals sit on the outskirts of the forest at night, mesmerized by the rhythmic chanting and singing. It is well-known that the Wee People are mysterious and wise and centuries old. In the back field the moles run underground in the early dawn’s light. 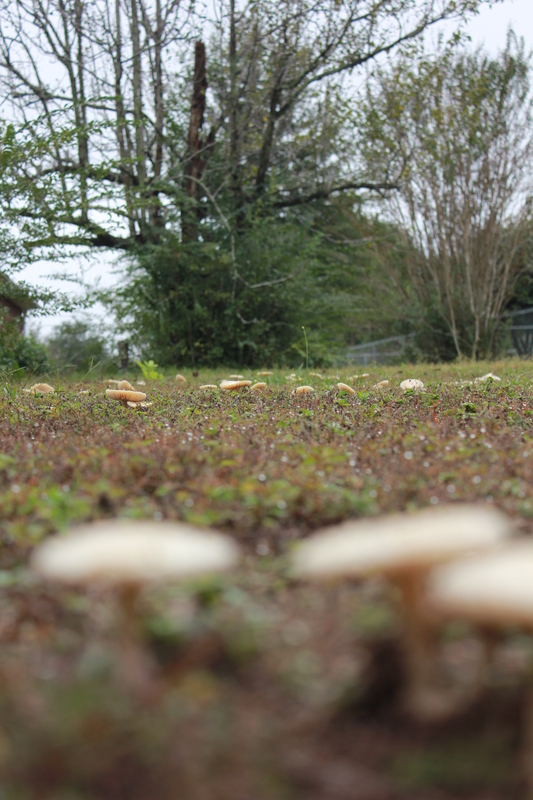 A single mushroom canopy is evidence of the herd’s keeper, making sure the moles are safe, allowing them their freedom. There is an old legend in the world of The Giants. It says that the mushrooms are poisonous. 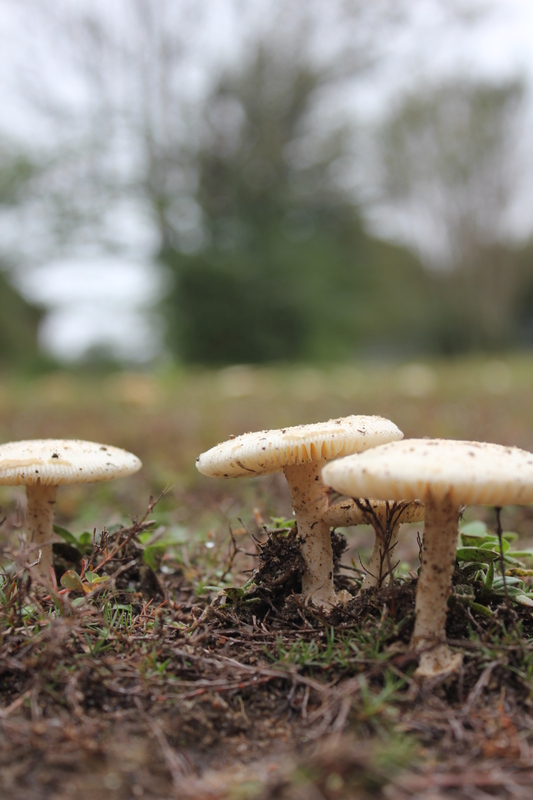 As the Wee People enter the yard and plant their mushroom seeds they lay a curse on The Giants and their dogs who may dare to remove or eat the canopies. Giants don’t always listen and suffer the consequences: pain and fever and sometimes death. But the only thing the Wee People really want is to live in peace with Mother Earth and Nature, to co-exist with The Giants, to be able to sing their songs and chant their chants. All they ask is for everyone to respect their village of white or yellow or brown mushroom canopies. When the spring heat arrives the Wee People disappear, perhaps riding off on their little moles heading north or maybe disappearing underground, sleeping in the caverns created by the wintering moles. It remains a mystery to this day where the Wee People go. The Giant’s machines then cut the lonely mushroom village in the spring, returning the mulch to Mother Earth. Thus another season passes. But for now, in the cold and rain and dark, in the winter’s harsh winds, if you turn your head and listen ever so closely you may hear the voices from under the mushrooms as the Wee People sing and chant and celebrate their life. This entry was posted in Fantasy and tagged fantasy, Mother Earth, mushrooms, Nature. Bookmark the permalink.